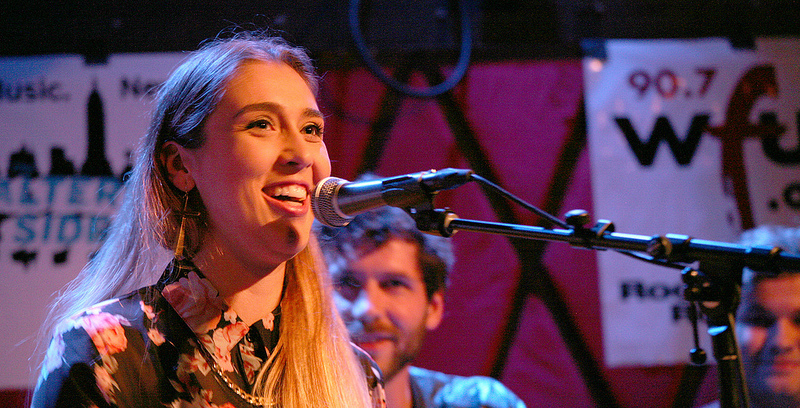 We — that is, The Alternate Side's Alisa Ali and TAS/UKNY's Kara Manning — survived the 2013 CMJ Music Marathon last week. From October 15-19 we ran around the Lower East Side, Greenwich Village and various spots in Brooklyn, clutching our badges, and saw as many sets as possible at New York's annual four-day showcase of emerging bands. Below, a CMJ roundup of the bands that we liked best or found most memorable, like Claire, Courtney Barnett, Joanna Gruesome, Public Service Broadcasting, Landshapes, Tiny Ruins, Torres and more. We both saw many of the same bands and artists — a happily serendipitous circumstance — which enabled us to find common ground when choosing our overall CMJ "bests." Alisa also caught one of the two Arcade Fire shows in Bushwick, a non-CMJ event that was both vaunted and criticized for overshadowing the festival itself. There were a handful of bands that were okay, but didn't stir us as much as we hoped they would, and a couple that nearly sent us fleeing to the street, but we decided not to write about them. CMJ is a frantic, exhausting experience and not every set can soar. Sadly, we both missed bands like Eagulls, Hookworms, Speedy Ortiz and The Preatures which all received a healthy dose of CMJ buzz. As for our top three picks of CMJ "breakout" bands? We were both in agreement that Courtney Barnett and Public Service Broadcasting easily won our vote for CMJ favorites with Alisa picking Landshapes as her third choice and Kara choosing Joanna Gruesome. The promising London quintet's daytime set was easygoing and unhurried, swollen with dense, fuzzed-out layers and sugary, effervescent vocals, but in a live setting, THOAP seemed unbalanced. Bassist and backing singer Kelly Owens has the steady gaze, charisma and demeanor of a frontwoman, whereas Stephanie Min seemed pained to carry that weight, frequently closing her eyes to shut out the crowd as she murmured the lyrics. — K.M. For a band to deliver a supernova of a set in bright daylight and instantly, by word of mouth, dominate CMJ as the unmissable act of the week is a rare accomplishment — and one that the rambunctious pop punkers Joanna Gruesome achieved with insouciance, nimble fury and real humor. Floating above the brash chaos, guitar assaults and pretty melodies of songs like "Sugarcrush" and "Secret Surprise" was the preternaturally calm Alanna McArdle who, with a long, flirtatious gaze or a banshee-like holler, commanded the room, as one fellow CMJ attendee observed, like a punk Jean Seberg. Watch a video of "Sugarcrush" that seems to have been posted by The Pains of Being Pure At Heart's Kip Berman, a Slumberland labelmate. — K.M. Mississippi singer-songwriter John Murry is cryptic and eccentric, a tripped-out John Martyn acolyte with kohl-rimmed eyes, a drawl that recalls Tennessee Williams at his most histrionic and an arsenal of achingly personal songs that beckon for intervention, salvation or, at the very least, a hug. The near-empty Mercury Lounge was a disappointment, but lent itself to the intimate nature of Murry's set of raw confessions, delivered like a prophet. — K.M. New Zealand's Holly Fullbrook of Tiny Ruins writes delicate songs, fragile as seashells, that flow and ebb gently against lyrical shorelines. Armed with an acoustic guitar and the help of The Clean's Hamish Kilgour on percussion, the tender beauty of Fullbrook's set could have drowned out in the din of CMJ's beer-swilling madness, but she was lucky enough to draw the candlelit cellar of Rockwood Music Hall this night, a snug, romantic space where an appreciative, small crowd could take in her gentle parsing of songs like the gorgeous "Me at the Museum, You at the Winter Gardens" from Tiny Ruins upcoming second album, Brightly Painted One, due out in 2014. — K.M. Any concerns of how the very British character of Pubic Service Broadcasting's invigorating collages of samples drawn from old film, driving guitar gallops, lush synths and motorik beats would play out in New York were unfounded. The talented duo was stuck with a bad, late-night maiden slot in the dungeon of The Delancey at the base of the Manhattan Bridge, but they kept calm and carried on with a cheeky, distinctive set, soldiering through the club's muddy sound system. Luckily, PSB snagged two more shows on Saturday, including a Brooklyn Bowl gig that allowed them to excel with their vibrant multimedia mission, the way it was intended, with exhilarating selections from their debut album, Inform-Educate-Entertain, like "ROYBGIV," "Spitfire" and "Night Mail" (the video to the latter is below). — K.M. The Auckland, New Zealand band might lean on the past like so many of their psychedelic-leaning compadres, from Temples to Tame Impala, but Ghost Wave's hazy, jangling guitar pop, drawn from their album Ages, manages to distinguish itself from the fray. Singer and songwriter Matthew Paul has a sleepy appeal as a vocalist, although the recently added tambourine-playing Andy Frost was confusingly placed front and center like an ersatz Davy Jones, shaking his long blond ringlets, but uttering nary a note. — K.M. The Sydney, Australia pair recently released their debut EP, One Type of Dark, and onstage, Ginger and the Ghost expand their new-age pop with quirky visual excess; singer Missy twirled and leaped around a paper-maché glacier, wearing sequined hot pants and buoyed by what seemed to be 500 yards of marshmallow tulle. Her partner Dan stoically maintained synth bleats, beeps and beats. There was something charming, if excessive, about the set, but given the duo's DIY effort (how did the glacier make it through customs? ), catchy songs and charm, worth investigating. — K.M. Melbourne's Courtney Barnett flitted through CMJ week performing with a band or solo, depending on the venue or the hour. At this late afternoon outing — the more Barnett performed, the bigger the crowds got — she was alone, accompanied only by a growling electric guitar and a novel's worth of clever lyrics. Her low-key demeanor and dry, deadpan delivery — like Liz Phair meets Lucinda Williams — added to the real delight of Barnett's witty words, wryly dissecting ordinary life, lamenting an asthma attack ("Avant Gardener") or drolly describing, via a brand new song, the perils of househunting in the decried Melbourne suburb of Preston. — K.M. This is a four-piece from London featuring three enchanting sirens and a drummer, very skilled at creating moody atmospheres with brushes and sticks. What was really outstanding was how seamlessly the three singers vocalized together. Aside from their harmonies, which were impressive enough on their own, each of the women were able to them pick up where the last singer left off on lead vocals. This feels like a band that are all connected Borg style (excuse the "Star Trek" reference, I mean it in the best possible way). Each member of Landshapes seems to know exactly what the other person is thinking or where they plan on going musically. Their debut album, Rambutan is out now. Check out their gorgeous video for the song, “In Limbo”. — A.A.
Vancouver-based Bear Mountain bring a serious dance party vibe. When I got to Pianos to see this band the entire crowd was dancing. After (politely) squirming my way to the front, I noticed that the band itself had some pretty sweet dance moves as well. I also noticed that front man and drummer are identical twins. No wonder they were so in synch! I was also taken with their keyboard/ keytar player. You don’t really see keytars all that often. & This guy was not using it as a shtick — he was really rockin’ out. Here's the song, "Two Step" from their debut album, XO, which is out now. — A.A.
Back in Brooklyn on Saturday night for the amazing, well-curated Brooklyn Vegan party at Baby's All Right. I got a chance to catch several great acts including Mackenzie Scott, aka Torres. I’d heard her SXSW set earlier this year which I enjoyed, but my appreciation for her has skyrocketed after seeing her during CMJ. Electric guitar really suits her and her songs are so stirring. She’s a very versatile musician, rocking out at times and then softly painting scenes with colorful (though, at times, dark) lyrics. See what I’m talking about by watching this video of Torres performing “Jealousy and I” from her self-titled debut released earlier this year. — A.A.
Oh, of course I should mention the Arcade Fire show in Bushwick. They played both Friday and Saturday night. I went on Friday and to be honest, I felt a little guilty about going because I knew that there were so many great new bands that I’d never seen before. The spirit of CMJ is — or really should be — about music discovery. However, after being offered a golden ticket, I just felt like I could not refuse. I was so curious about the “secret” show and the party called for formal wear or costume and I do love to dress up. I went as Lakshmi Singh from NPR News — because she’s awesome and it was easy and fun. Also, how often do I get to play the race card with costumes? Anyway, The set was pretty short and mostly filled with new material from their forthcoming album, Reflektor, but they did play "Neighborhood #3" and "Sprawl II." James Murphy introduced the band on the one stage and then, moments later, the curtain dropped on a different stage where they played. The crowd raced over to the new stage and the party started. After Arcade Fire played their last song, Win Butler announced that they would now be DJing instead of playing live. The audience reacted by booing. Win tried to — ahem — win the crowd back by saying, "Hey we’re gonna be in the crowd dancing with you all night though." Still, the majority of the crowd left after Arcade Fire stopped playing. All in all it was a fun event. I got to see Arcade Fire, which was a real treat. I danced next to a banana and interviewed Andy Warhol. — A.A.